Ideal for general use, shows, pony club, jumping, dressage, hunters and adult riding clubs. Easy care wipe over or sponge with hot soapy water or synthetic saddle cleaner. Made from synthetic leather-look Beta Biothane. 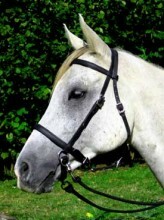 Reins are not included with this bridle. Cob usually fits 13.2-14.3hh (137cm-150cm). Comes in black, or chestnut brown Standard Biothane with brass fittings.